All good stories have great beginnings. If it draws you into its world with little more than mysterious teasers, you know you’re hooked. You know you want more. 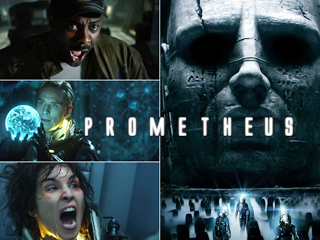 Ridley Scott’s Prometheus brings all that to the table and then some more. The film, releasing June 8, takes the viewer across universes to a world like our own, yet in many ways far removed. The film, brought to you by the studio that gave you James Cameron’s Avatar, works its magic in pretty much the same way. In full-blown 3-D. It has intrigue, thrills ‘n’ chills, action, adventure, a fantastic voyage of discovery and more than anything else, an otherworldly experience. Also, the two directors are connected in more ways than one. Prometheus is widely touted as the prequel to Scott’s highly acclaimed Alien, the sequel to which was directed by Cameron. And as Avatar producer Jon Landau notes, “Ridley came to visit the set, and we shared with him everything we were doing. We would like to think that visit was part of his inspiration to film Prometheus in 3D and the outstanding trailer will inspire you to see the film in 3D as well.The film, starring Noomi Rapace, Michael Fassbender, Charlize Theron, Logan Marshall-Green, Idris Elba and Guy Pearce among others, is about a group of explorers from earth aboard a spaceship named Prometheus on a fact-finding mission to a planet several galaxies away.